Ephemeris for Thursday, July 20th. Today the Sun will be up for 15 hours and 4 minutes, setting at 9:20, and it will rise tomorrow at 6:17. The Moon, 3 days before new, will rise at 4:26 tomorrow morning. As of tomorrow it will be one month to the Great American Eclipse, a total eclipse that will span the continental United States from Oregon to South Carolina. Here in northern Michigan, the Sun will be, at maximum 75 percent covered by the Moon around 2:20 p.m. The eclipse will last from 12:58 to 3:40 p.m. approximately. 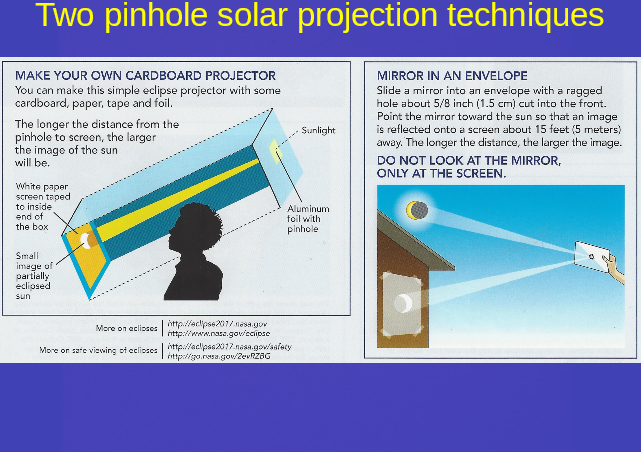 It will not be safe to look at the Sun without a solar filter or by projecting the image of the Sun on a white paper, either with a pinhole, one side of a binocular, or telescope. Hold the paper screen a foot or so behind the eyepiece. Try it before the eclipse. Or sit under a tree, and let the pinholes between the leaves project a myriad of suns on the ground. 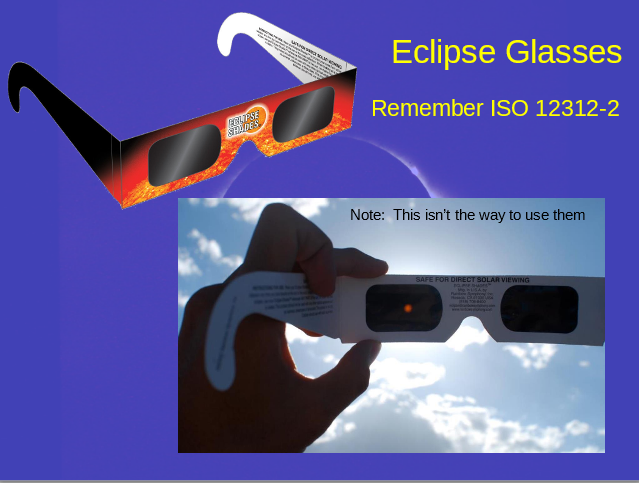 Check gtastro.org for lots of links to information about the eclipse. 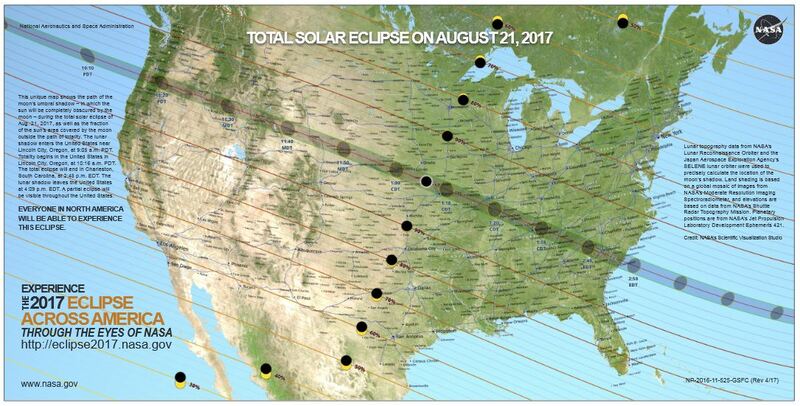 All 50 states will see some part of the August 21, 2017 solar eclipse. The face of the Sun will be totally covered by the Moon in the narrow band called the path of totality for up to 2 minutes, 40 seconds. Credit: NASA. These are eclipse glasses which can be gotten for a couple dollars or less. They are especially difficult to use, especially for people who wear glasses and can’t remove them because they are near-sighted. Personally I do not recommend them, instead relying on one of the projection methods. Be especially careful about children using them. Remember the ISO 12312-2 compliance that should be printed on them. Do not use welders filters. Damaging exposure to the eyes is painless and may not show up for a day or two. 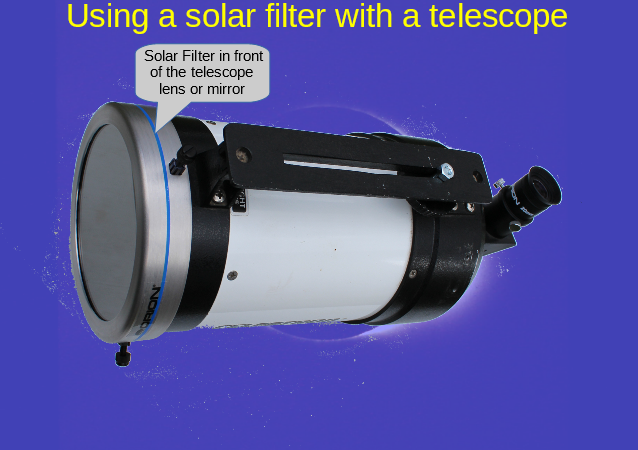 In using a solar filter with a telescope or binoculars the filter must be placed in front of the objective (front of the telescope). Solar filters that fit into eyepieces are dangerous and can shatter with the heat. Such filters should either be smashed and added to your favorite landfill, or taken to the bay to see how many times you can skip it on the water. 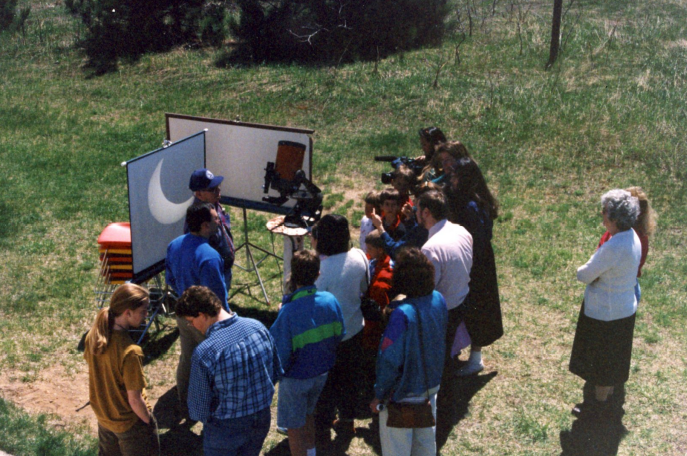 Pinhole projection is the simplest way to project the Sun’s image. A long box can be used to project the image inside. 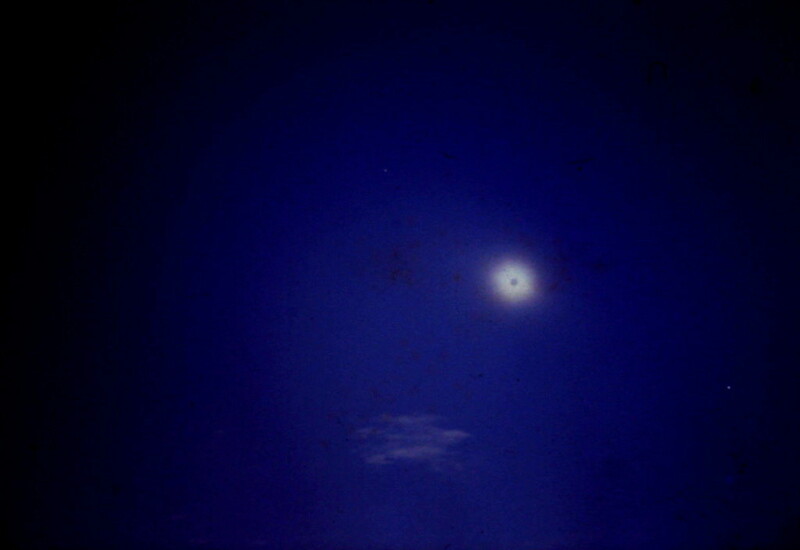 The diameter of the pin hole is a compromise between sharpness and brightness of the image. …The farther the image is projected the larger it is. The throw of the image can be increased by using a mirror masked with a quarter of an inch or larger hole and sending the image 10 or more feet away. 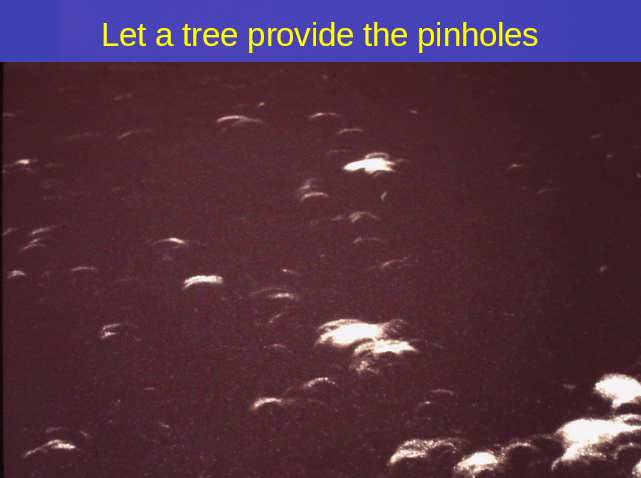 Let nature provide the pinholes. Sit under in the shade. Stay cool, And watch the Sun’s images on the ground. 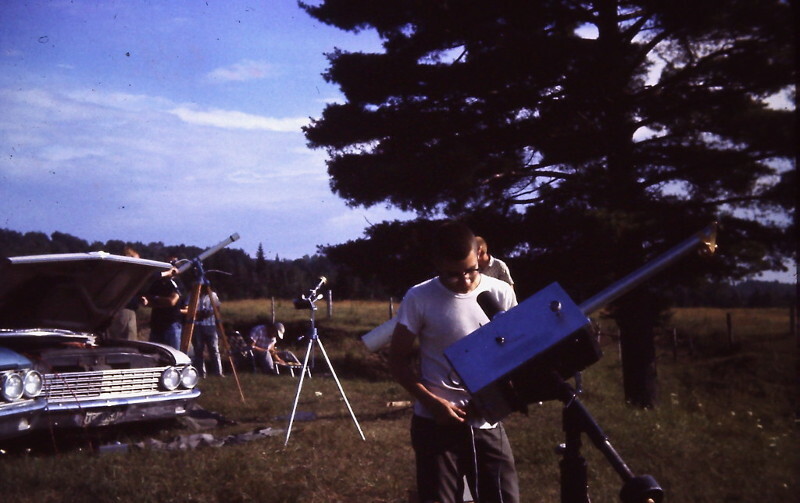 Here’s an 8” Schmidt Cassigrain telescope, with a low power eyepiece projecting a large image on a movie screen. For lots of people to view and photograph. Credit Eileen Carlisle. 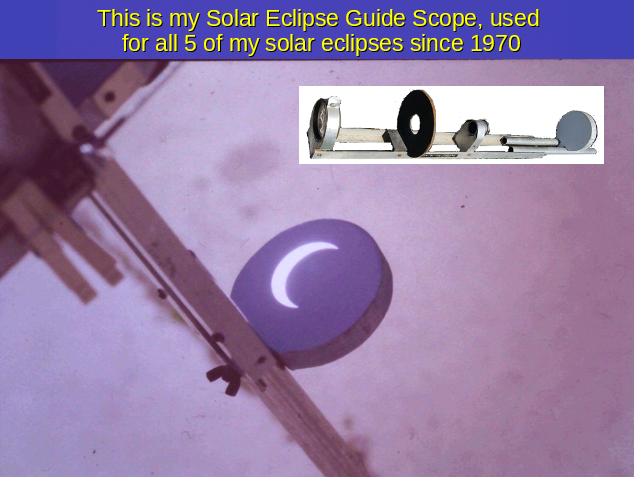 This is my Solar Guide Scope which I used for all my solar eclipses starting with 1970 (three total and 2 annular). It is an open design, with an objective of about 300mm (12”) focal length, a shield to shield the screen from the Sun, a cheap 12mm (1/2”) focal length eyepiece and an adjustable screen to project the Sun’s image. I originally made it too short, so I extended it. It always attracts a crowd of eclipse watchers. 41 years ago (1976) the Viking 1 Lander landed on Mars. 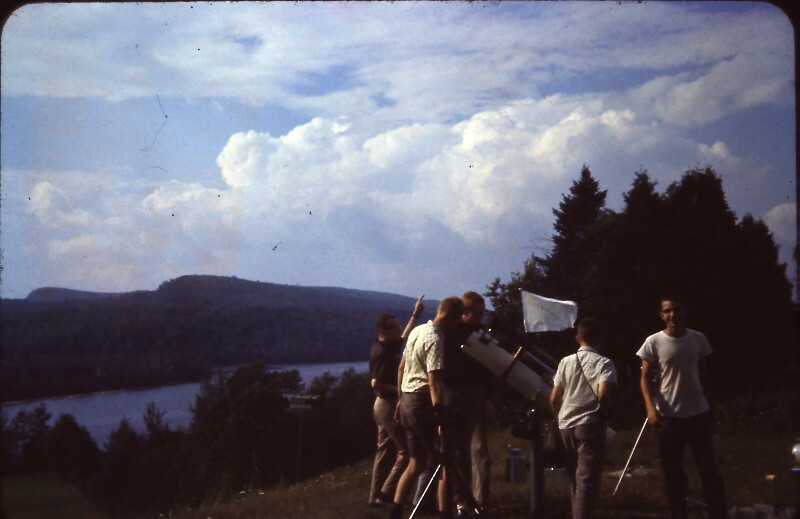 On a personal side: 54 years ago (1963) I saw my first total solar eclipse. The 54th anniversary isn’t the big deal. The big deal has to do with the Saros, the period in which eclipses repeat. That interval is 6,585.3211 days or approximately 18 years 11 1/3 days, give or take a day, depending on the number of leap years in the interval. That one-third day is the kicker, because the next eclipse in the series will occur 120 degrees of longitude west of the last eclipse. There are many Saros series running at any given time, so eclipses don’t only happen every 18 years. However after 3 Saros periods the eclipse will again occur at roughly the same longitude. If the Moon passes the Sun moving slightly southward, the eclipse series will trend southward on the globe. If northward, the series heads north. 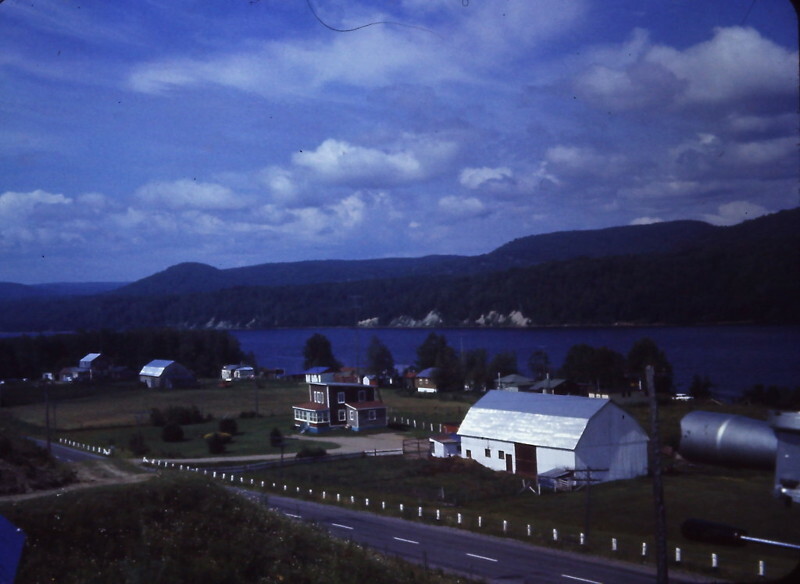 Since this upcoming eclipse tracks southward, the 1963 eclipse was farther north with the path of totality passing through Alaska, Canada and only the state of Maine. 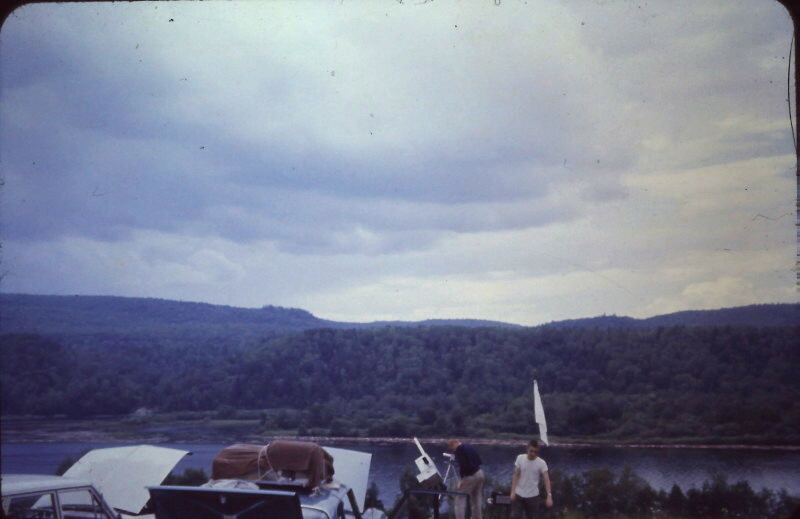 On that day, friends John Wesley, Dave DeBruyn and several other members of the University of Michigan team, and Stan Carr, a member of the Muskegon Astronomy Club found ourselves on a hill overlooking the St. Maurice River in Quebec Province of Canada. Overlooking the St Maurice River from our camp in the morning with the clouds then. But the eclipse would start about 4:30 in the afternoon. At two p.m. and we’re socked in. Seen is John Wesley and our automated eclipse camera. 2 1/2 hours to totality. Happy day! The eclipse is starting, and it’s clearing up. John Wesley checking the tracking of our eclipse camera. It was for naught. Due to an operator error all the film was wound up when power was applied to the controller, because I left a switch in the wrong position. A shot with a 50mm lens with a guessed exposure. Thanks to GIMP and modern digital processing I was able to recover the over exposed image. But like all eclipse photographs, doesn’t really show it as the eye reveals the dynamic light levels of the corona.